Nose (88): more than average. honey, vanilla, malt, citrus, spices, cinnamon, toffee. Palate (86): smooth, oily. honey, wood, citrus, sherry, nuts, spices, wood. Finish (86): longer than average. honey, citrus, spices. So based on other whiskies I have already tasted I rate this Ballantine's Finest with 87 points over 100. Nose (89): more than average. honey, wood, spices, citrus, vanilla, cinnamon, pears. Palate (87): smooth, oily. honey, smoke, wood, spices, citrus, cinnamon, nuts. 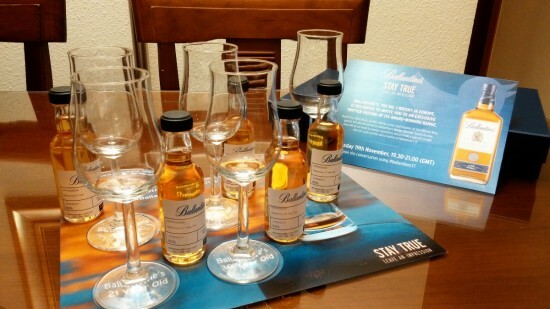 So based on other whiskies I have already tasted I rate this Ballantine's 12 year Blue with 88 points over 100. Palate (89): powerful, oily. honey, citrus, spices, fruits, mango, nuts, wood, smoke. So based on other whiskies I have already tasted I rate this Ballantine's 17 year with 89 points over 100. 70cl / 43% - A refined and elegant entry in Ballantine's range of blends, introduced in 1993 and relying on a core of malts from Miltonduff and Glenburgie. Nose (91): more than average. honey, spices, candies, wood, nuts, chocolate, vanilla, citrus, liquorice. Palate (91): powerful, oily. honey, vanilla, cinnamon, spices, citrus, cocoa, fruits, liquorice. Finish (91): longer than average. honey, liquorice, spices. So based on other whiskies I have already tasted I rate this Ballantines 21 Year Old with 91 points over 100. Nose (93): more than average. honey, flowers, candies, vanilla, liquorice, citrus, cinnamon, white chocolate. Palate (93): powerful, oily. honey, candies, flowers, fruits, spices, vanilla, mango, cinnamon, wood, liquorice. So based on other whiskies I have already tasted I rate this Ballantines 30 Year Old with 93 points over 100. I have been taken by surprise! What a fantastic tasting! Really I love the oldest Ballantine’s: 21yo and 30yo. It is a pity that as with many good whiskies nowadays the price tag is out of my pocket.